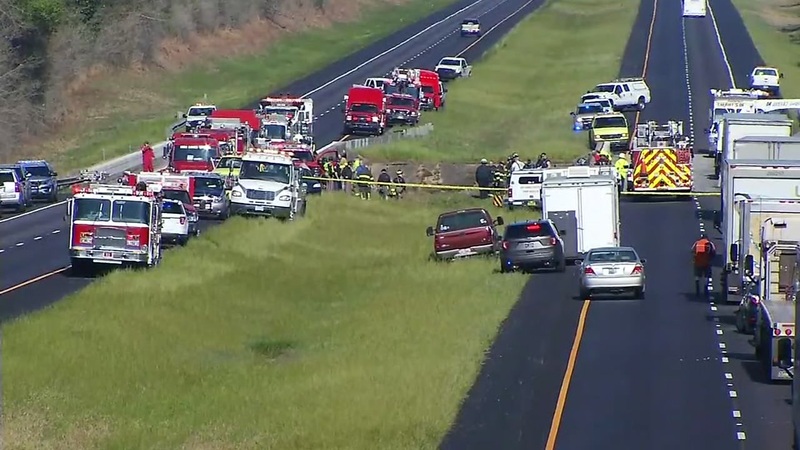 LOXLEY, Ala. -- A bus carrying high school band members home to Texas from Disney World ran off a highway and plunged into a deep ravine Tuesday in Alabama, killing the driver and injuring many passengers, authorities said. About 45 people were on the bus, the sheriff said. The driver was killed, said Capt. John Malone, who commands state troopers in the Mobile district. At least 34 people, most of them teenagers, were treated at hospitals or other facilities in Pensacola and southwest Alabama for injuriese that ranged from minor to very serious, medical officials said. The sheriff said it wasn't immediately clear what caused the bus to enter the grassy median, which abruptly ends at a steep embankment where the interstate passes over Cowpen Creek. The crash happened at about 5:30 a.m., crunching the bus and leaving the passengers exposed to chilly temperatures. Rescuers used every piece of equipment on every truck to reach them, Mack said: "This is what we call an all-out." Tejeda said he watched four people being removed from the wreckage, and couldn't hear any yelling or sounds of panic. "Thank God they were alive but (they) had to take them on (a) helicopter," he said in an interview conducted by instant messages. "My daughter was really groggy because they had her on some very heavy pain medication," he said. "They sounded kind of shook up. I think I'd be shook up as well." Torres said his brother, also a member of the Channelview band, was on another bus not involved in the accident. That bus stopped after realizing what happened, but did not allow the students to get off, and eventually continued home from Orlando, where the band performed at a music festival on Saturday. Only hours before the crash, the band's Facebook page had been updated to show a large group posing outside Disney World.